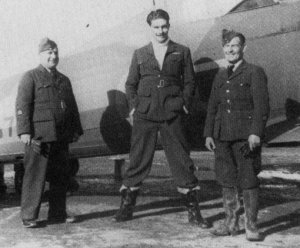 'Tap' Jones (middle) in late 1940. Edward 'Tap' Gordon Jones was born on 31 August 1914 in Lancashire and was brought up in Widnes, near Liverpool. After school he entered Liverpool University to study Medicine before deciding to pursue veterinary science. Although he loved shooting, gun dogs and the outdoor life he had no real interest in being a vet, his sole ambition being to fly with the RAF. He neglected his studies, concentrating on rugby and courting his future wife, a fellow student. Eventually, his powerful mother gave up and let him join the RAF. He joined the RAF in 1935, and in 1937 was serving as Pilot Officer in 17 Squadron's 'B' Flight on Gauntlets, from which 80 Squadron was formed in March of that year; he became the unit's first adjutant in May. He was married in 1938 to Margery Hatfield. He was promoted Flying Officer and went with the squadron to the Middle East in April 1938, becoming a flight commander in March 1940. ‘A’ Flight included Squadron Leader R. C. Jonas (CO), Flight Lieutenant Jones, Flying Officer George Kettlewell, Pilot Officer Anthony Hugh Cholmeley,Pilot Officer Ernest Mason, Pilot Officer Arthur Weller, Pilot Officer Johnny Lancaster, Pilot Officer P. T. Dowding, Sergeant Donald Gregory, Flight Sergeant T. C. Morris and Sergeant J. C. Hulbert. On 28 June 1940, he took command of the flight formed in the squadron with the first Hurricanes. He became temporary commanding officer on 19 August 1940 after Squadron Leader Patrick Dunn left to form 274 Squadron. After the arrival of the new CO, Squadron Leader William Hickey, on 27 August, he was to lead a flight of Gladiators to Greece. 80 Squadron was ordered to Greece and on 18 November the ‘B’ Flight of 80 Squadron left Egypt and reached Athens with at least nine Gladiator IIs led by Squadron Leader William Hickey and including Flight Lieutenant 'Pat' Pattle, Flying Officers Greg Graham and Sidney Linnard, Pilot Officers Samuel Cooper, 'Heimar' Stuckey and William Vale and Sergeant Charles Casbolt. “A” Flight of 80 Squadron led by Flight Lieutenant Jones left Egypt for Greece on 23 November. On 27 November Squadron Leader William Hickey led nine Gladiators from 80 Squadron off from Trikkala to patrol to the north of Yanina. Here they spotted a trio of S.79s escorted by some dozen 150o Gruppo CR.42s, led by Capitano Nicola Magaldi, commander of the 364a Squadriglia. The British pilots attacked at once. Flight Lieutenant Jones (Gladiator II N5816) and Sergeant Donald Gregory (Gladiator II N5776), each claiming one Fiat shot down. Magaldi was killed in this combat and Sergente Giovanni Negri returned to base unhurt, but with his aircraft very badly shot-up. On 28 November 1940, six Gladiators from 80 Squadron's 'A' Flight flew a fighter mission led by Flight Lieutenant Jones. Over Delvinakion they reported meeting 20 CR.42s. This was in fact ten aircraft of 150o Gruppo C.T. led by Capitano Giorgio Graffer, CO of the 365a Squadriglia. In the ensuing dogfight Flying Officer H. U. Sykes (Gladiator N5812) and Sergente Corrado Mignani collided, both pilots being killed. Flight Lieutenant Jones, after claiming two CR.42s shot down off the tails of fellow pilots, had Gladiator N5816 badly shot-up, his instrument panel smashed, and a bullet wound in his neck. He was escorted back to Yanina by Sergeant Donald Gregory, where he managed to land safely. Sergeant Gregory claimed three destroyed CR.42s in this combat. Flying Officer Wanklyn Flower was also shot-up in N5854, but believed he had shot down one CR.42 first. Gladiators N5788 flown by Flying Officer W. B. Price-Owen and N5786 flown by Flying Officer F. W. Hosken were also damaged, but both pilots also claimed one probable CR.42 each. He returned to operations on 21 December and on 27th became commanding officer. At 10:30 on 9 February 1941, Squadron Leader Jones led off 14 of 80 Squadron's Gladiators on an offensive patrol over the Tepelene area. They took off in four sub-flights led by Jones, Flight Lieutenant "Pat" Pattle, Flying Officer 'Shorty' Graham and Flight Lieutenant "Timber" Woods. During the take-off Flying Officer W. B. Price-Owen, in the last section, experienced engine stoppage as his Gladiator became airborne and he was forced to glide back to the airfield. At about 15:00 Squadron Leader H. L. I. Brown and Squadron Leader Jones led of eleven Gladiators of 112 Squadron and seven of 80 Squadron to patrol over the designated area; they were accompanied by the 'W' Wing leader, Wing Commander ’Paddy’ Coote, flying an 80 Squadron Gladiator. Fifteen minutes later Flight Lieutenant 'Pat' Pattle in Hurricane V7589 led Flying Officer Nigel Cullen (V7138), Flying Officer Wanklyn Flower (V6749) and Flying Officer Richard Acworth (V7288) to the same area, while Flight Lieutenant Young led four 33 Squadron Hurricanes to patrol near the coast. Here some S.79s were seen and chased over Corfu, two being claimed damaged, one of them by Pilot Officer D. S. F. Winsland (Winsland was later during the war shot down by Bernardino Serafini). These were probably 105o Gruppo B.T. aircraft, which reported being attacked by Spitfires, one Savoia landing at Tirana with one member of the crew dead. Jones received an immediate DFC, and was also awarded a Greek DFC (gazetted on 25 December 1942) for his performance during the day. After a spell of leave in Egypt, he returned at the end of March to the unit, now fully re-equipped with Hurricanes, just before the German invasion of 6 April. He acted briefly as Wing Commander at Eleusis before the British forces withdrew from Greece, rejoining the squadron in Crete until the end of the month. On 29 April Squadron Leader Jones and Flying Officer Wanklyn Flower departed from Crete, leaving the small Malmeme detachment under Flying Officer William Vale’s command. After the withdrawal from Greece, he served with 80 Squadron in Egypt, Palestine and Cyprus until September 1941 and was awarded a DSO. On 6 September 1941, he left the command of 80 Squadron to Squadron Leader T. M. Morgan DFC. Following a year with the Rhodesian Air Training Group, he returned to England to command the fighter airfield at Hawkinge, Kent. In July 1943 he was promoted to Group Captain and joined the staff preparing the tactical air plan for the invasion of Europe, responsible for co-ordinating fighter operations in No. 83 Group. The group's headquarters moved to France within days of the invasion to establish fighter strips and co-ordinate the close support operations of its Spitfire and Typhoon squadrons. As the land battle moved eastwards, Jones and his staff followed immediately behind. On his departure after 18 months he was appointed OBE. In December 1944, Jones returned to operational flying, having been given command of No 121 Wing of four Typhoon squadrons at Vokel, Holland. During constant action against ground targets, the rocket-firing Typhoons became the scourge of enemy transport on roads, railways and canals. As the war in Europe ended, Jones left to join the disarmament staff. Jones ended the war with 5 victories, all of them claimed while flying Gladiators over Greece. He remained in the service, where he enjoyed an illustrious career. Uniquely, he never served in the Air Ministry or Ministry of Defence. After serving at the School of Land/Air Warfare he commanded a jet flying school before serving on operational duties at the HQ Second Tactical Air Force. He was attached to the HQ Air Task Force in charge of operations during the Suez crisis, and in 1957 he took command of RAF Wyton, the home of the RAF's strategic reconnaissance force. On promotion to Air Commodore in January 1959, Jones was appointed AOC the Central Reconnaissance Establishment. He then became AOC, RAF Germany 1961-63, at a time when the Cuban missile crisis brought his squadrons to a high state of readiness. He was then Senior RAF Officer on the Directing Staff of the Imperial Defence College until 1966, when he became AOC, RAF Malta, and Deputy Commander in Chief (Air), Allied Forces, Mediterranean. On promotion to Air Marshal in November 1966 he was appointed AOC-in-C Near East Air Forces and Administrator of the Sovereign Base Areas in Cyprus. From 1967 to 1969 he was Commander of British Forces, Near East. He retired in August 1969. Jones was appointed CBE in 1956, CB in 1960 and KCB in 1967. Jones passed on 20 February 2007. TOTAL: 5 destroyed, plus possibly 1 more, of which no details have been found. (a) 80 Squadron claimed two Fiat CR.42s. 150o Gruppo lost one when the CO Capitano Nicola Magaldi was killed. A second Fiat was damaged but the pilot Sergente Negri was unhurt. (c) During this large engagements RAF made claims for 5 and 2 damaged BR.20s, 3 and 2 damaged S.79s, 13 destroyed, 3 probable and 1 damaged CR.42s and 6 and 3 probable G.50bis. In fact 4 BR.20s of 37o Stormo B.T. were lost with several damaged, 1 S.79 of 104o Gruppo was damaged, 1 CR.42 of 160o Gruppo and 2 G.50bis of 24o Gruppo were lost. Regia Aeronautica claimed 6 and 2 probable Gladiators and 1 ‘Spitfire’ while in fact only 1 Gladiator of 112 Squadron was lost.